In this complete workout on the Dr. Dish CT, our good friend and partner Jordan Lawley breaks down the step back move. 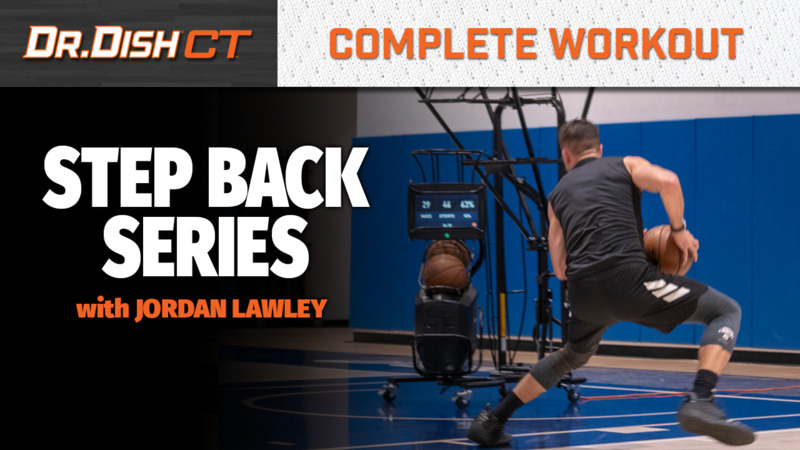 We've seen a meteoric rise of the step back in the past few years especially as it's become one of the most used moves at the professional and college levels to create space for an open jump shot. Also in this complete workout, Jordan finishes with a burning ball handling drill: The continuous cross-between-behind. Remember, with Dr. Dish workouts, you can either choose a pre-made workout or build your own. In this workout, challenge yourself to make a certain number of shots from a certain number of spots before moving on to the next drill. Once you hit that specific "drill goal" the machine will transition seamlessly into the next drill. Once players finish the workout, they will be able to see their final stats/heat map and save it to their profile where they can view all of their workouts and track their progress.